The micro:bit has 25 external connections on the edge connector of the board, which we refer to as ‘pins’. The edge connector is the grey area on the right side of the figure above. There are five large pins, that are also connected to holes in the board labelled: 0, 1, 2, 3V, and GND. And along the same edge, there are 20 small pins that you can use when plugging the micro:bit into an edge connector. power input: If the micro:bit is powered by USB or a battery, then you can use the 3V pin as a power output to power peripherals with. If you hold the ‘GND’ pin with one hand, you can program the microbit to detect yourself touching the 0,1 or 2 pins with your other hand, giving you three more buttons to experiment with (you just used your body to complete an electrical circuit). There are 20 small pins numbered sequentially from 3-22 (these pins are not labeled on the micro:bit, however, they are labelled in the picture above). 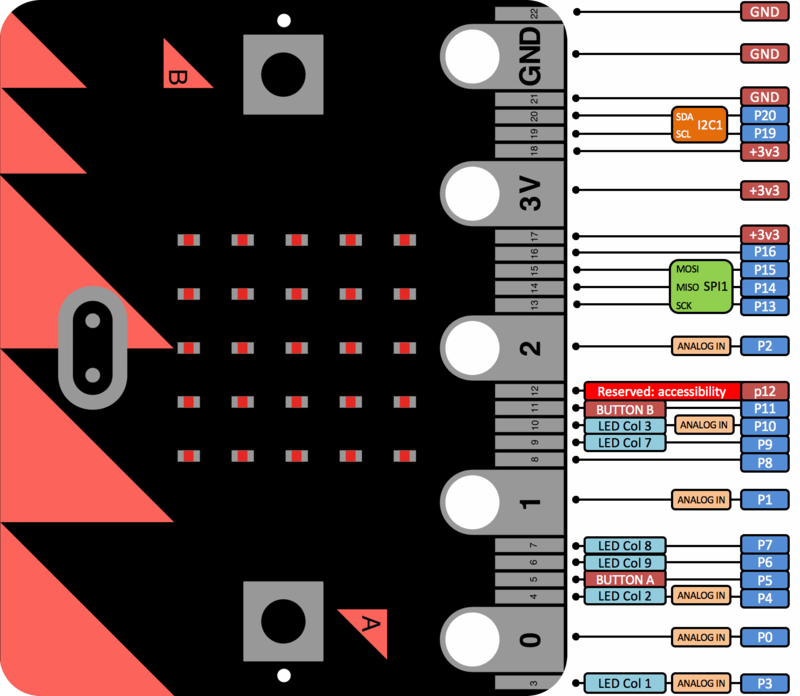 Unlike the three large pins that are dedicated to being used for external connections, some of the small pins are shared with other components on the micro:bit board. For example, pin 3 is shared with some of the LEDs on the screen of the micro:bit, so if you are using the screen to scroll messages, you can’t use this pin as well. pin 5: GPIO shared with Button A. This lets you trigger or detect a button “A” click externally. This pin has a pull-up resistor, which means that by default it is at voltage of 3V. To replace button A on the micro:bit with an external button, connect one end of the external button to pin 5 and the other end to GND. When the button is pressed, the voltage on pin 5 is pulled down to 0, which generates a button click event. pin 12: this GPIO pin has been reserved to provide support for accessibility. It is recommended that an edge connector be acquired to connect to the small pins. More information on compatible edge connectors will be available later.